Can stack with a 25% Off Starbucks Bags Target Cartwheel (x4/14). But there is also a Buy More Save More Sale starting 4/14 for $5.99 each wyb 3 that will save you even more. If you are shopping today, 4/13, you can get a FREE $5 Gift Card when you spend $15 or more on deodorant or body wash. But even if you miss todays deal, we frequently see others. The Delizza Mini Eclairs & Cream Puffs are on sale thru 5/4 for $5.69. Might make for some easy sweet treats for the upcoming Easter Holiday. 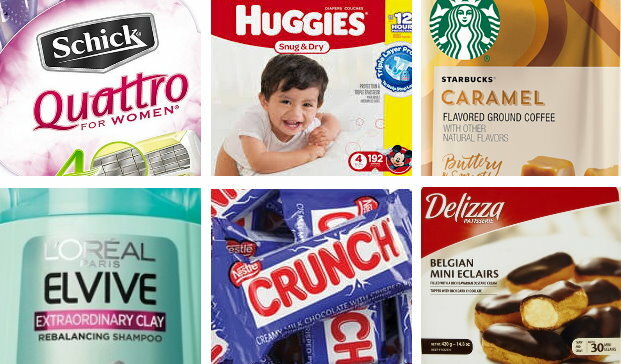 If you are shopping today, 4/13, there are gift card deals on Diapers, Pants & Wipes. Or starting tomorrow, 4/14, there will be an in-ad coupon for a FREE $15 Gift Card wyb $75 in diapers, wipes or pants. If you are shopping today there is a nice high-value 25% Off 100 Grand, Crunch, Baby Ruth fun size bags Target-Cartwheel (x4/13) to stack with. Grab this super-nice coupon while it is still there! We have rebate offers on the ibotta app, and starting 4/14, you will get a FREE $5 Target Gift Card wyb 3. We often see gift card deals for L’Oreal Hair care & sometimes cartwheels too.